Just got home from a few hours of decorating my classroom. We don’t start until after Labor day, so I still have plenty of time but I like to go in a little early and get a head start. We have to take everything down in June- which is a bummer but at the same time it forces me to recreate myself in the fall. 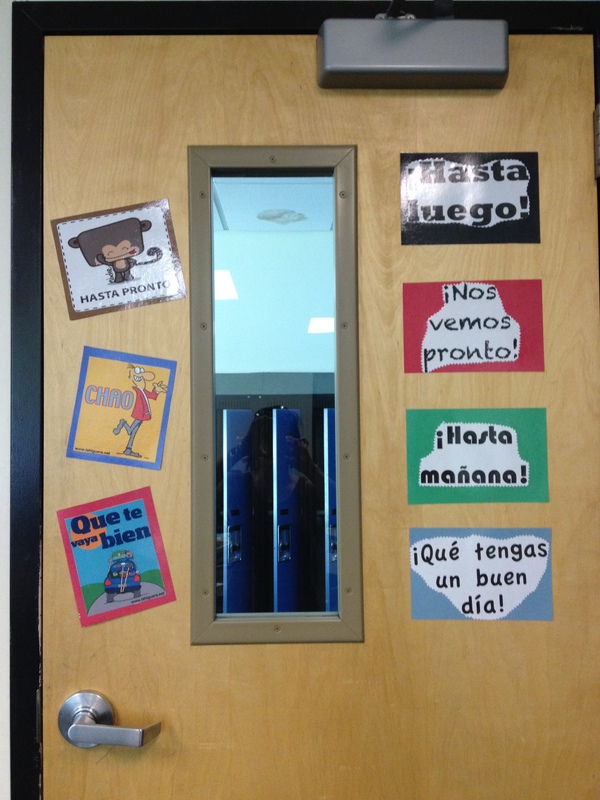 My goal is to make my students feel like they are walking into a Spanish -Speaking country when they come into my room. 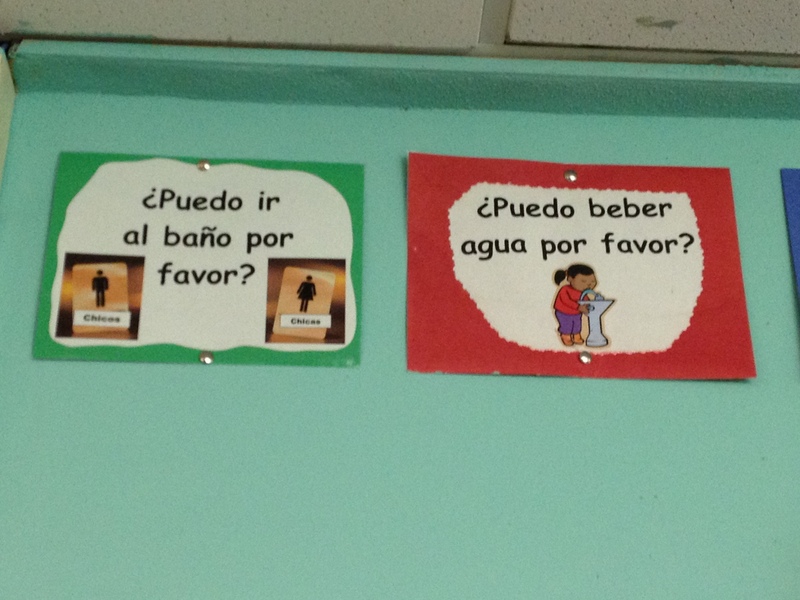 I try to combine cultural images with signage that will help them pick up and learn new vocabulary. I’m far from done but here are some pics of what I have done son far. What do you think? 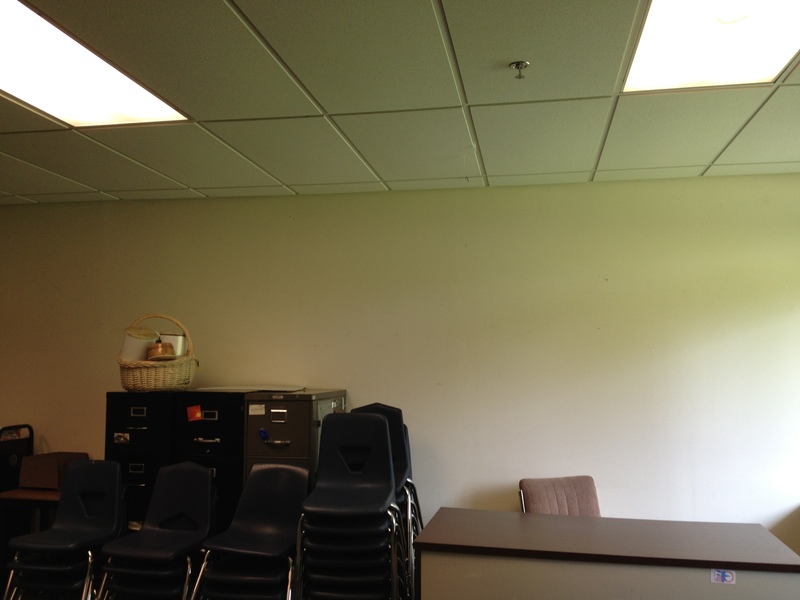 Any ideas for my blank bulletin boards? This bulletin board is in a super weird corner in my room. In years past I’ve put many different things on it- mostly posters and student work but no one ever looked there because it is in the back corner of the room. Stealing from my colegas over at Creative Language, I decided to make the board a little more functional. 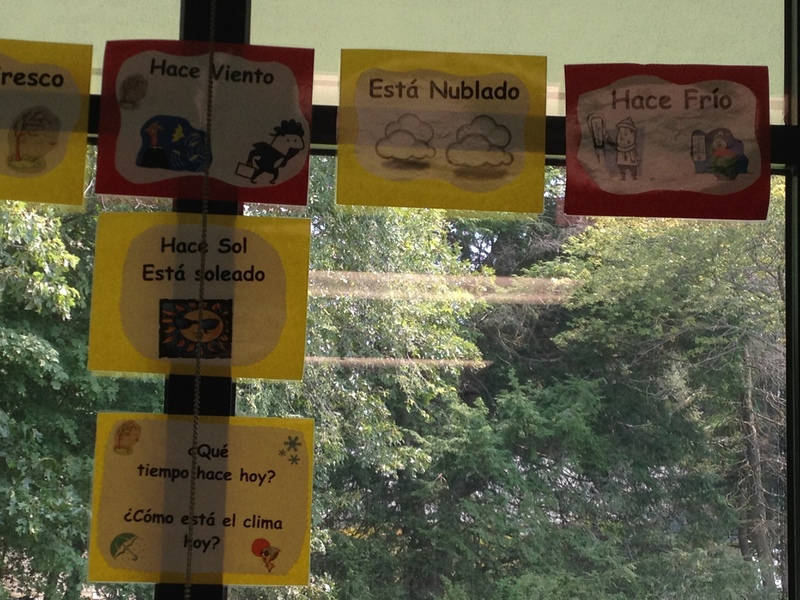 I called it “El Rincón Estudiantil” and the first 3 folders are – frases útiles (for extra vocab/phrase of the week sheets), el desafío (extra challenge work) and hojas de calentamiento (sheets that students use to complete their daily warm-up). 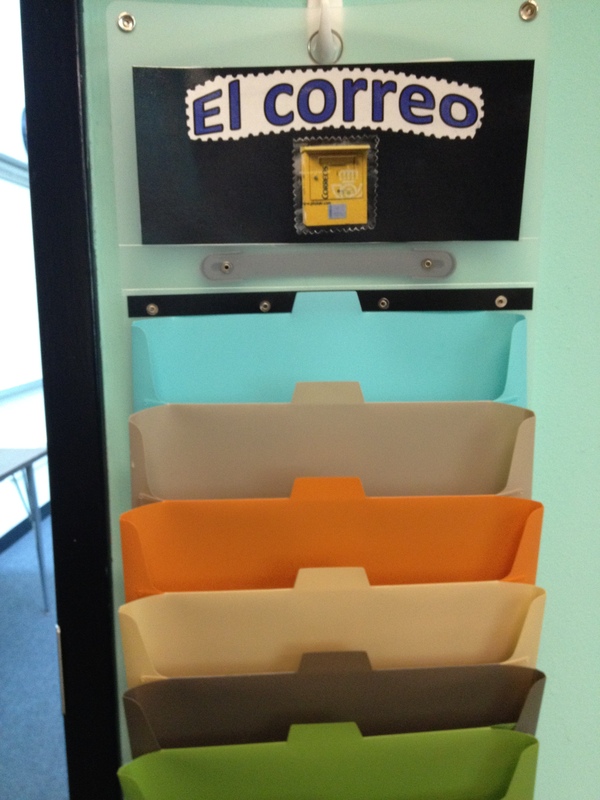 Then I got two hanging files from Target and labeled them by grade. 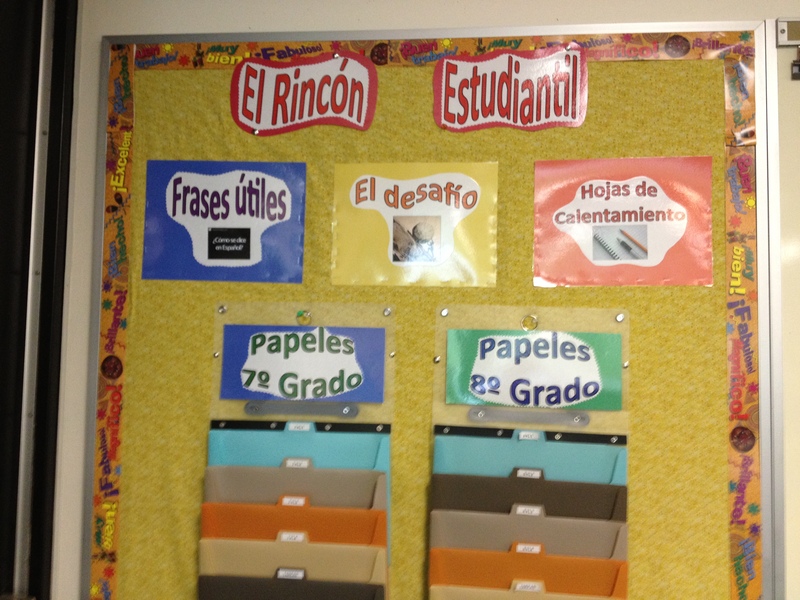 Each folder is labeled with the lesson (1-4) and then homework and assessments. This way if a student is out they can access what they missed. This all used to live on the side table and it was just a big, unorganized mess. Hopefully this will work! The background is fabric from walmart- it’s greener than using paper and it lasts longer- no fading! I only have two windows- but they are pretty big! Perfect for weather signs! 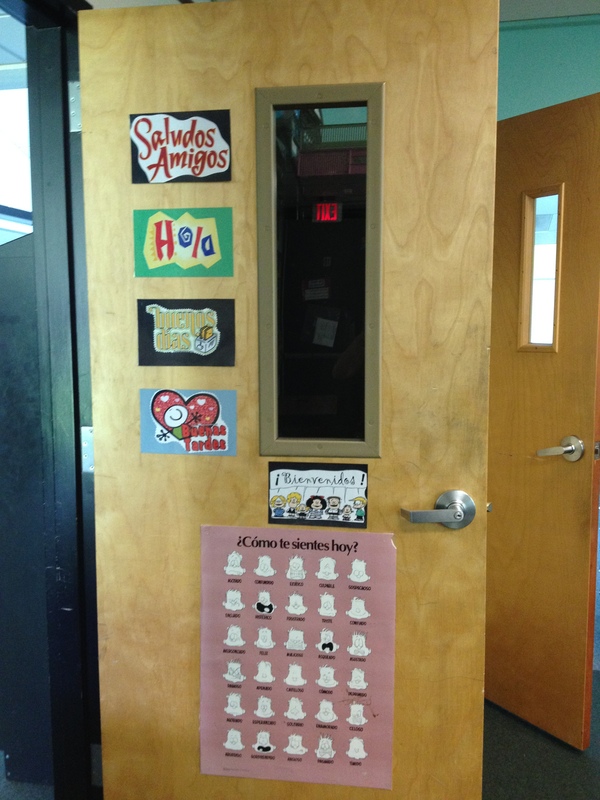 This is yet another steal from Creative Language- Using the doors for greetings and farewells. Brilliant! I’ve attached my word doc with the pics and phrases if you’re interested. 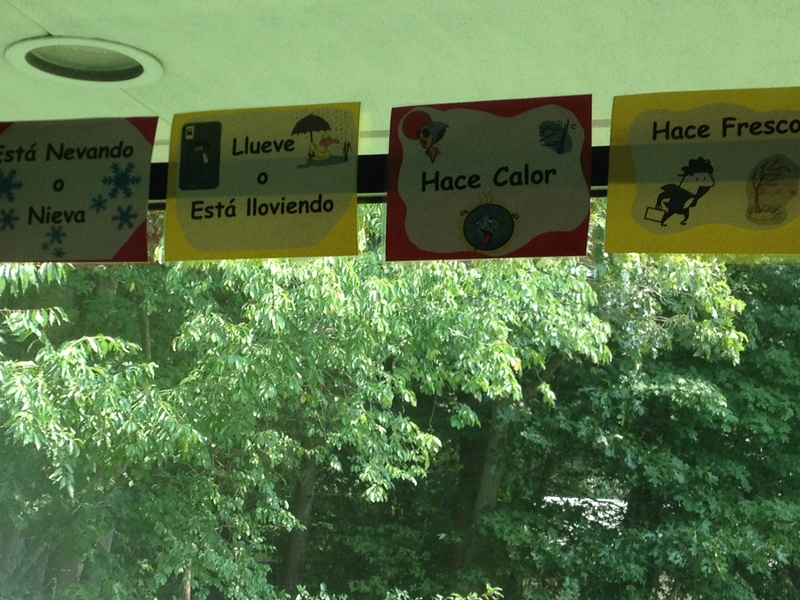 Then I have the space above my board- I created signs for the survival phrases they need in my classroom. I attached the file too- it is editable. 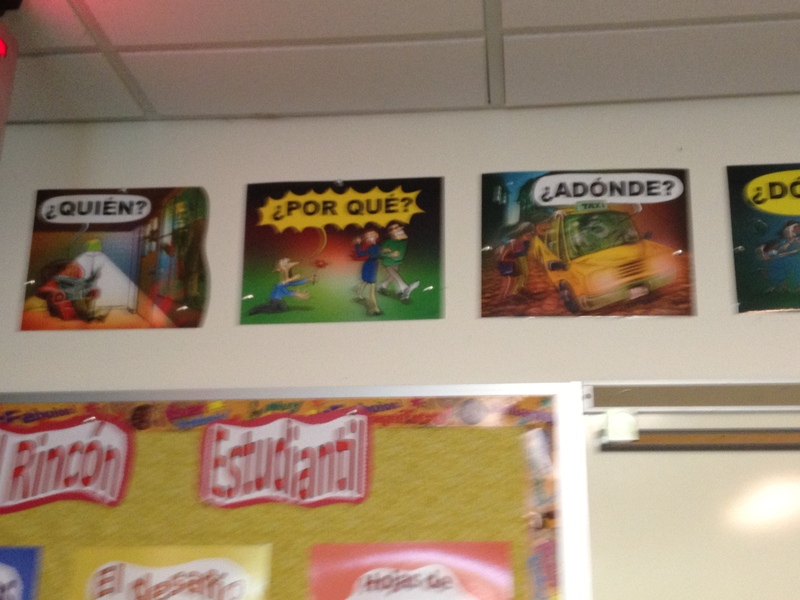 Frases para sobrevivir en mi clase! LOL! This next wall is my biggest challenge- there is just SO much space. I have many countries posters so I think I will just fill this space with those again. 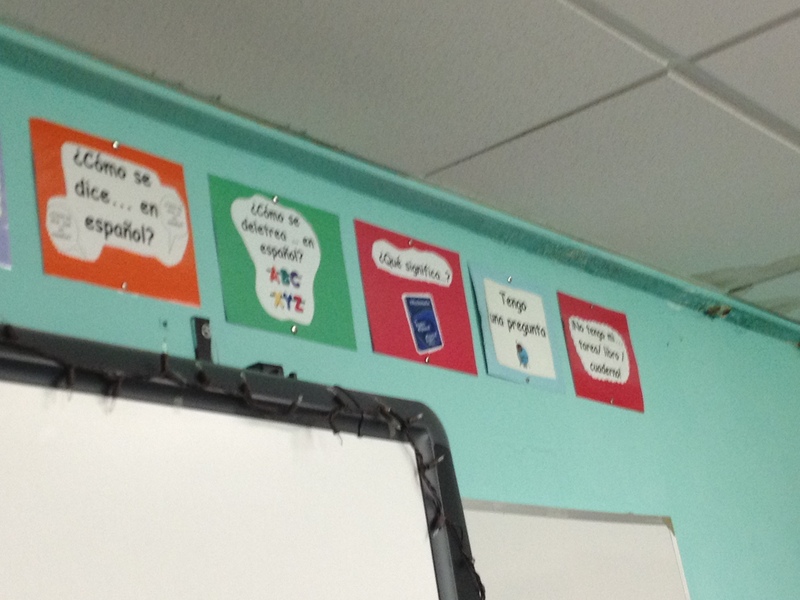 This is my inbox or correo- I use it to organize assignments and assessments turned in by class- it’s wonderful because I can just take it off the wall and take it home and grade. 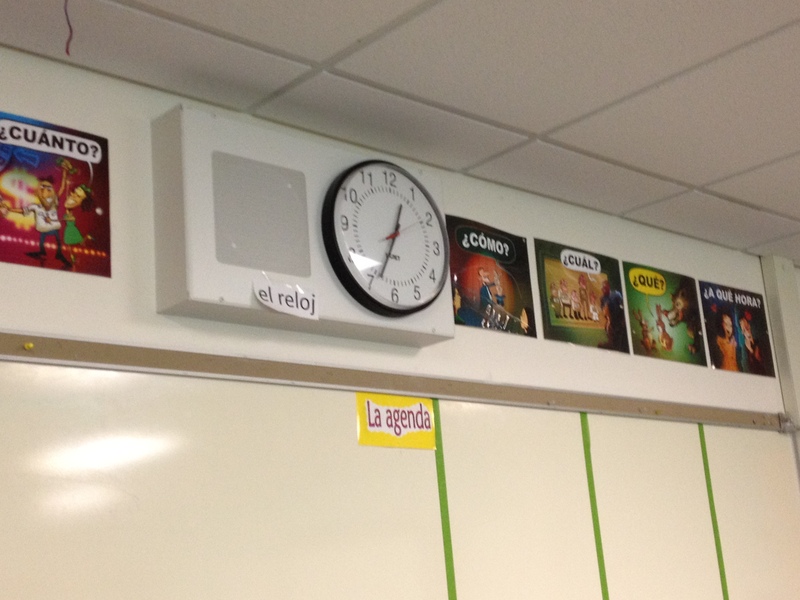 Also students know where to put things if they’ve been absent. Questions of the day! 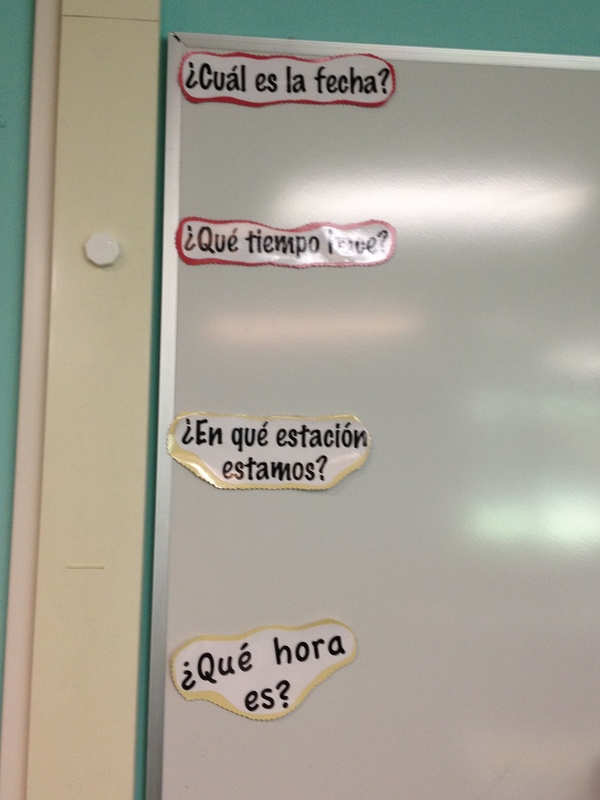 Every day (with both grades) after they have worked on their calentamiento, I greet the class and ask them these questions. Routine is great because they expect it and they get a lot of language out of it. My calendar is next to this with a makeshift bulletin board I made out of fabric and bulletin board borders- more pics to come. 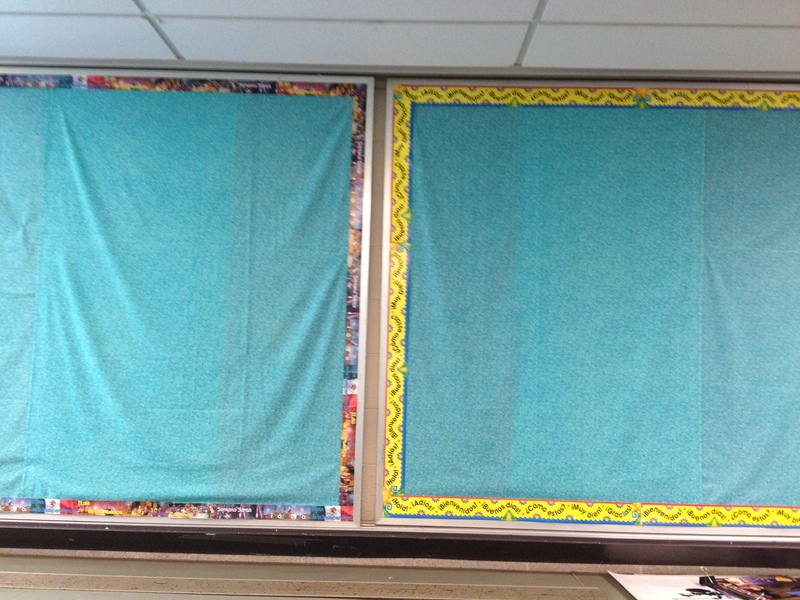 I have these two very large bulletin boards that I don’t know how to decorate. Any ideas? Again, I used fabric for the background and bulletin board borders I bought through Teacher’s Discovery and Carlex. I have some art posters as well as some realia. I want it to catch their attention. Ideas welcome! 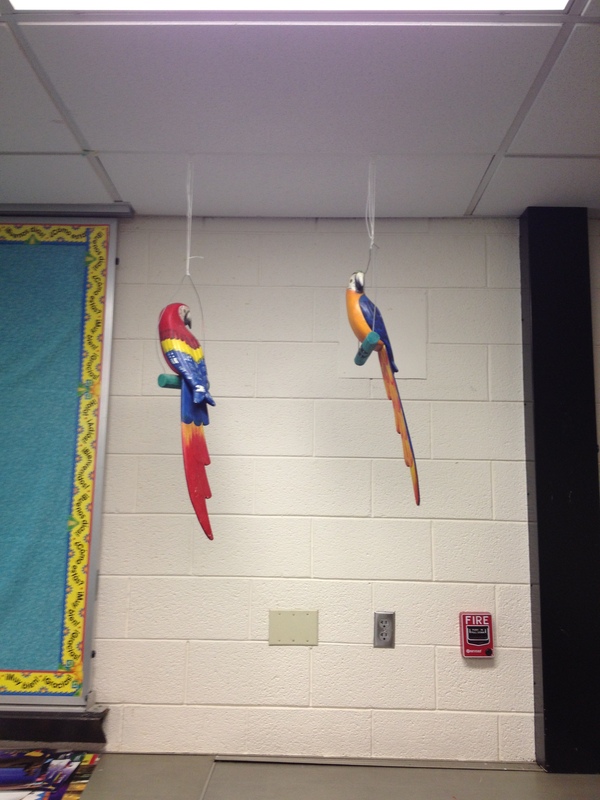 Here are two of my class “pets”- I got them in Colombia years ago. I usually have the kids name them every year. They like it and I talk to them as if they were part of the class! So, what do you think? Any ideas for my blank spaces??? ?